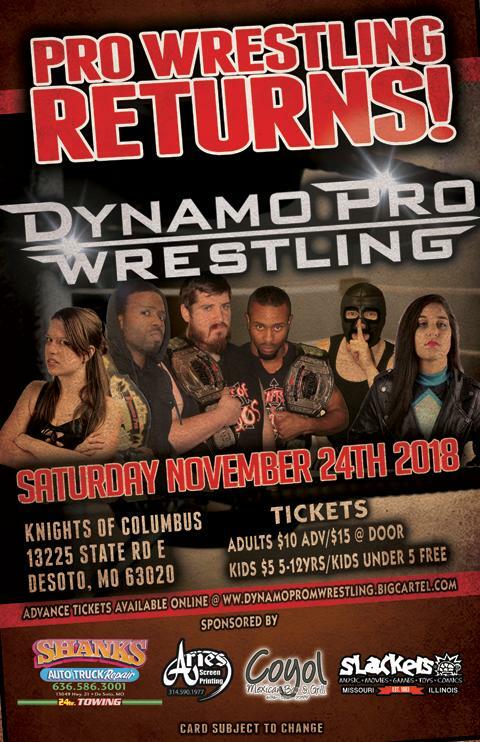 Dynamo Pro Wrestling is proud to announce an all-ages professional wrestling event on Saturday, November 24th. This professional wrestling event, sponsored by Shanks Auto and Truck Repair, Coyol Mexican Bar and Grill, Slackers, and Aries Screen Printing, will be held at the Knights of Columbus Hall, located at 13225 State Road E in DeSoto, Missouri. Doors open at 7:00 P.M. with a bell time of 8:00 P.M. Adult tickets are $10 in advance and $15 the day of the event. Tickets for children from five to twelve years old are $5. Tickets for children under five years old are free. Advanced tickets can be purchased at dynamoprowrestling.bigcartel.com. This event will see such Dynamo Pro Wrestling favorites such as Dynamo Pro Wrestling heavyweight champion “Lights Out” Adrian Surge, Dynamo Pro Wrestling tag team champions “The Agents of Chaos”, Dynamo Pro Wrestling D-1 champion Mike Outlaw, Dynamo Pro Wrestling women’s champion “The Empress of Evil” Rahne Victoria, C.J. Shine, “The Wind of Destruction” Makaze, “The Heartthrob” Jaden Roller, “The Valedictorian” Keon Option, Tony Asteem, Jimmi LaFleur, Jackal, “Mr. Moustache” Ricky Rodriguez, OuTtKaSt, “The King of Chaos” Ricky Cruz, Savanna Stone, “The Little Blue Dragon” Tootie Lynn Ramsey, and many more. Come out and experience the best in professional wrestling as Dynamo Pro Wrestling brings professional wrestling back to DeSoto, Missouri for the first time in over a decade. This entry was posted on November 11, 2018 at 9:48 pm	and is filed under Uncategorized. 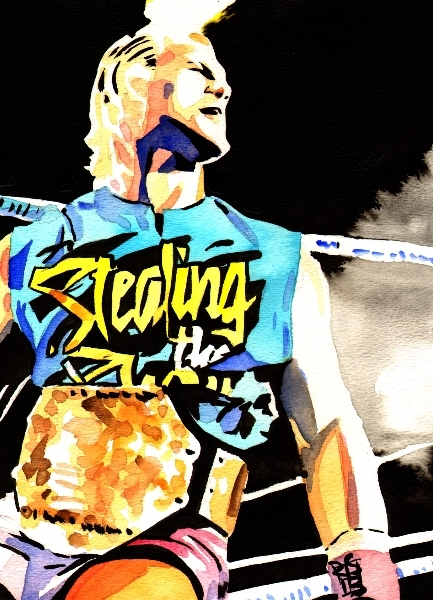 Tagged: Dynamo Pro. You can follow any responses to this entry through the RSS 2.0 feed. You can leave a response, or trackback from your own site.